Macallan’s Make The Call advert, featuring a man jumping off a cliff, has been banned in the UK for promoting ‘risky behaviour’. 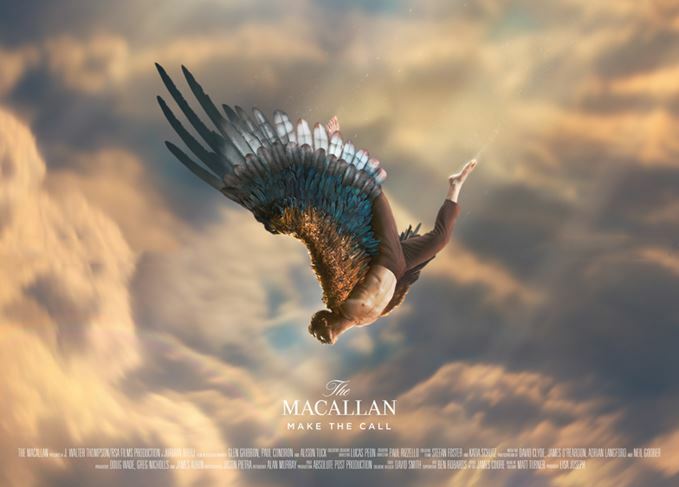 The 90-second advert was released in November 2018 as part of Macallan’s first global marketing campaign. Six complaints were made to the UK’s Advertising Standards Authority (ASA), challenging whether the ads were ‘irresponsible and linked alcohol with daring, toughness or irresponsible behaviour’. The ASA upheld the complaints, noting that the advert was reminiscent of the extreme sport of base-jumping. At the start of the advert, a man can be seeing peering over the edge of a cliff and clenching his fists, giving the impression that ‘he was nervous about jumping and was building up the courage to do so’. It ruled: ‘Whilst we acknowledged that some elements of the ad were fantastical, such as the distance the man fell through the clouds, and the sprouting of wings which enabled him to fly away instead of hitting the ground, we considered, nevertheless, that the central message of the ad, which was explicitly highlighted through the tagline “Would you risk falling ... for the chance to fly?”, was one of promoting risky or daring behaviour to reap possible rewards. Macallan’s owner, Edrington, had argued that the advert was intended to be mystical, and ‘clearly removed from the real world’. It said the tagline ‘Make the Call’ was used globally to reflect the brand’s philosophy, and referred to its own history of making tough decisions. It claimed that the story was ‘simply a metaphor about making decisions’. A spokesperson for Macallan said: ‘The Macallan co-operated fully with the Advertising Standards Authority in response to a small number of complaints about our brand’s global awareness campaign. ‘Prior to launching the campaign, we worked closely with the relevant bodies including Clearcast, ITV and Instagram who all deemed the campaign 100% acceptable. ‘In light of the ASA ruling, we have acted to address their concerns and removed the campaign film from relevant channels accessible by the UK audience. As phase one of the campaign is now complete, we will take onboard the ruling as we plan for next phase of the campaign. At the time of its release, Edrington heralded the advertising campaign – the first of its kind for the Scotch whisky brand – as marking ‘a new chapter in the history of The Macallan’. It was released to cap off a ‘momentous year’ for the brand, which opened its new £140 million distillery in Speyside in June. The Make The Call film was directed by RSA Films’ Juriaan Booij, and filmed by John Mathieson, the Oscar-nominated cinematographer behind Gladiator and X-Men. Is Scotch selling itself short (quite literally) when it comes to winning over new consumers?